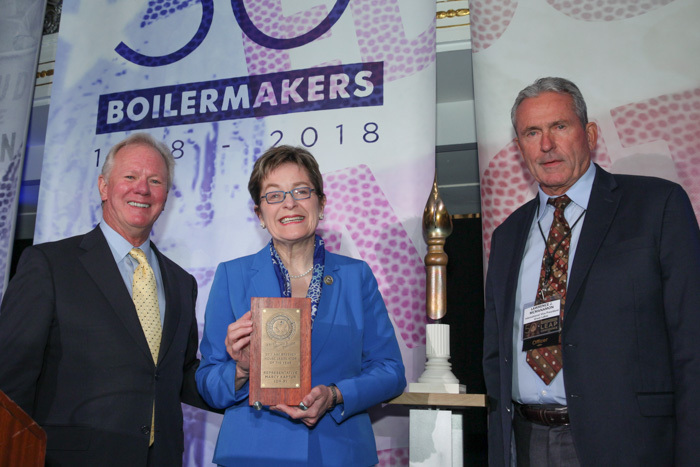 Rep. Marcy Kaptur accepts the Boilermakers’ top legislator award for a member of the U.S. House. L. to r., IP Newton Jones, Rep. Kaptur and IVP-GL Larry McManamon. 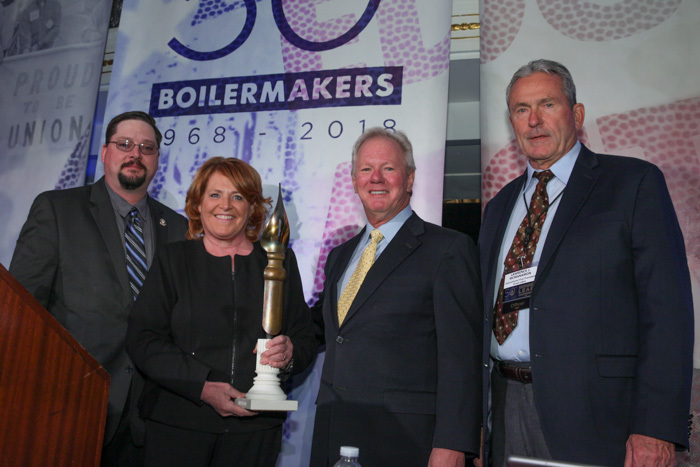 Sen. Heidi Heitkamp accepts the Boilermakers’ top legislator award for a member of the U.S. Senate. L. to r., L-647 BM-ST Luke Voigt, IP Newton Jones, Sen. Heitkamp and IVP-GL Larry McManamon. DURING CEREMONIES AT the union’s 50th LEAP Conference in Washington, DC, in April, two standout members of Congress received the Brotherhood’s highest recognition for their support of working people. International President Newton B. Jones presented Sen. Heidi Heitkamp and Rep. Marcy Kaptur with the Abe Breehey Legislator of the Year Award, a unique quill pen sculpture and accompanying plaque custom designed and crafted by the Boilermaker History Preservation Department. U.S. SENATOR HEIDI HEITKAMP (D-ND) is the first woman from North Dakota to be elected to the Senate (in 2013). She previously served as the state’s tax commissioner and later attorney general and has a reputation for being willing to work across the aisle. She also served as director of the Dakota Gasification Synfuels Plant. Heitkamp has been a champion of legislation vital to the Boilermakers and other labor unions, notably the FUTURE Act, which improves upon tax incentives for carbon capture, use and storage (CCUS) technology. She is also a cosponsor of USE IT (The Utilizing Significant Emissions with Innovative Technologies) Act, a bill that would support federal, state, and non-governmental collaboration in the construction and development of CCUS facilities and CO2 pipelines. U.S. REP. MARCY KAPTUR (D-OH 9th) is the longest-serving woman in the U.S. Congress — 36 years — and has a career pro-labor voting record of 97 percent. But those disappointments didn’t hold her back. Kaptur earned a graduate degree in urban planning and later caught the attention of President Jimmy Carter’s administration, becoming a domestic policy advisor. She won her first seat in the U.S. House in 1984 and has never lost a bid for re-election.